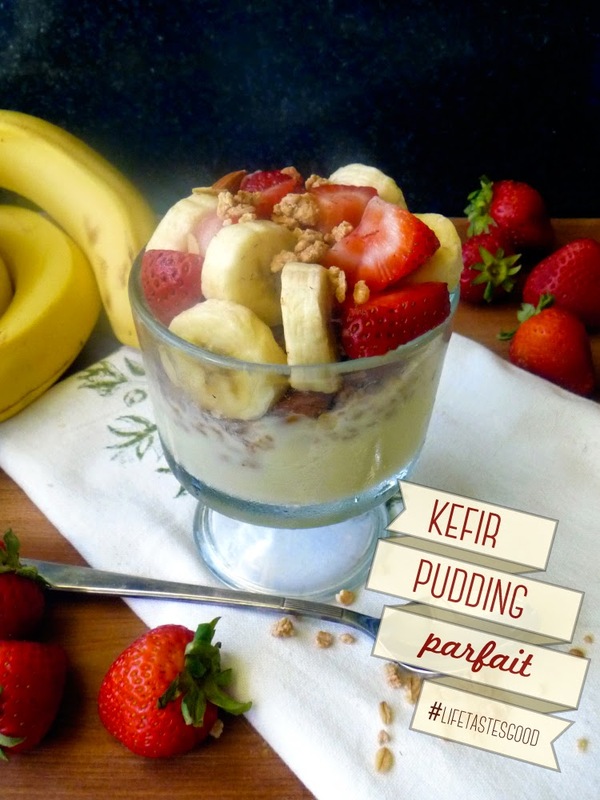 My Kefir Pudding Parfait is a healthy pudding you can feel good about eating and serving to your family. Don and I LOVE creamilicious snacks, but we've been eating many that aren't so good for us. In an effort to incorporate healthier sweet treats that are creamy and delicious into our diet I turned to Kefir, a fermented milk product loaded with good-for-you stuff! 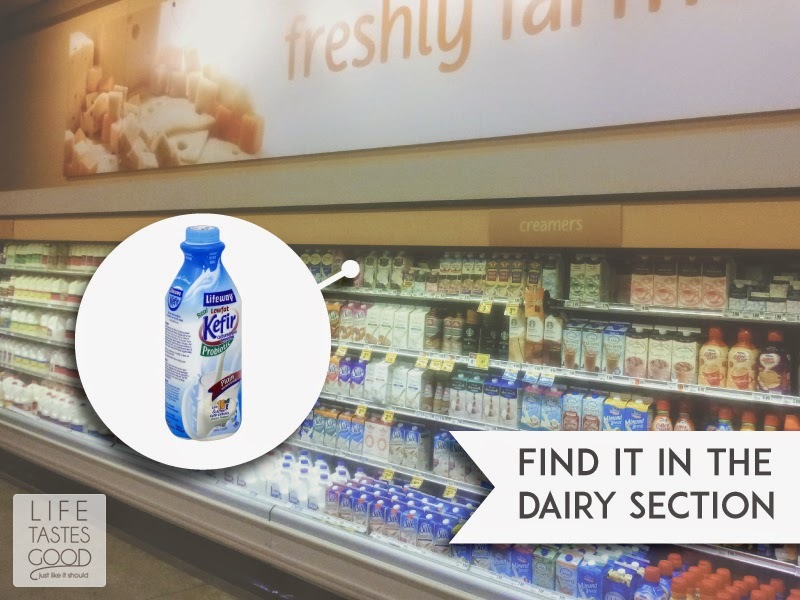 At Winn Dixie I found Lifeway Kefir cultured milk smooties in a variety of different flavors. I picked up the plain in hopes I could make some vanilla pudding for a fruit parfait. I wasn't sure if the Kefir would make a thick, rich, and creamy pudding, but I'm happy to report it did!! I am so excited about this!! Don and I can now enjoy healthier creamilicious sweet treats every day! 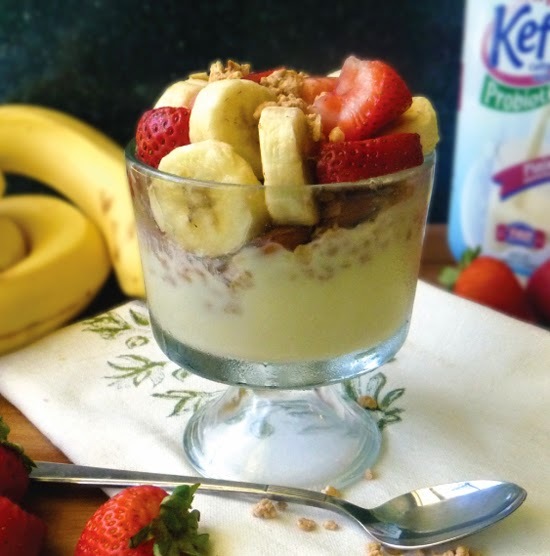 This parfait makes a great breakfast too! 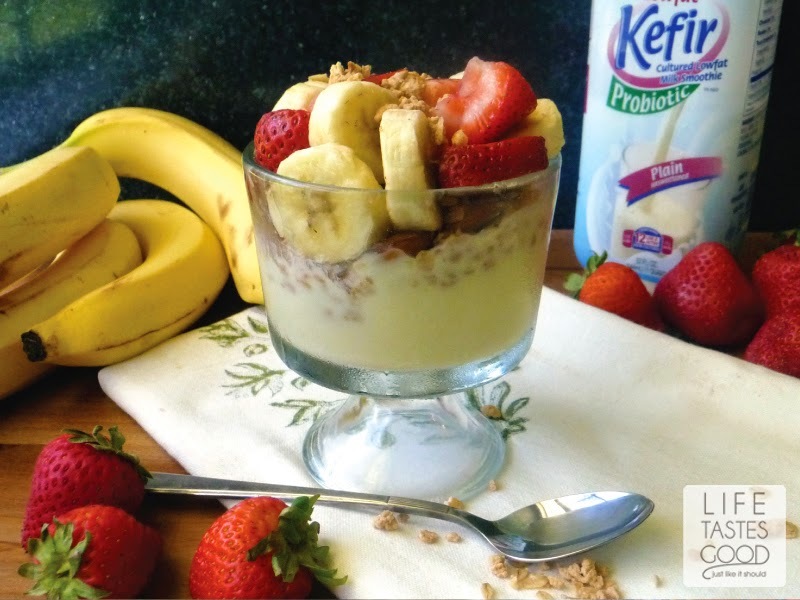 Kefir is loaded with 11 grams of protein in every cup! That is sure to keep you going!! It also has vitamin A and vitamin D3 which is very important for our overall health. There is a serious epidemic of D3 deficiency worldwide which is speculated to be the cause of many ailments. I learned about this when my daughter was diagnosed with Melanoma at the tender age of 20. We had her D3 checked and found it to be ridiculously low, so it is important she incorporate D3 into her diet as much as possible. This smoothie is a great way to do that! I wrote a post about the possible link between a Vitamin D Deficiency and Melanoma if you'd like to read more on the dangers. and this delicious, creamy, sweet treat is easy peasy. 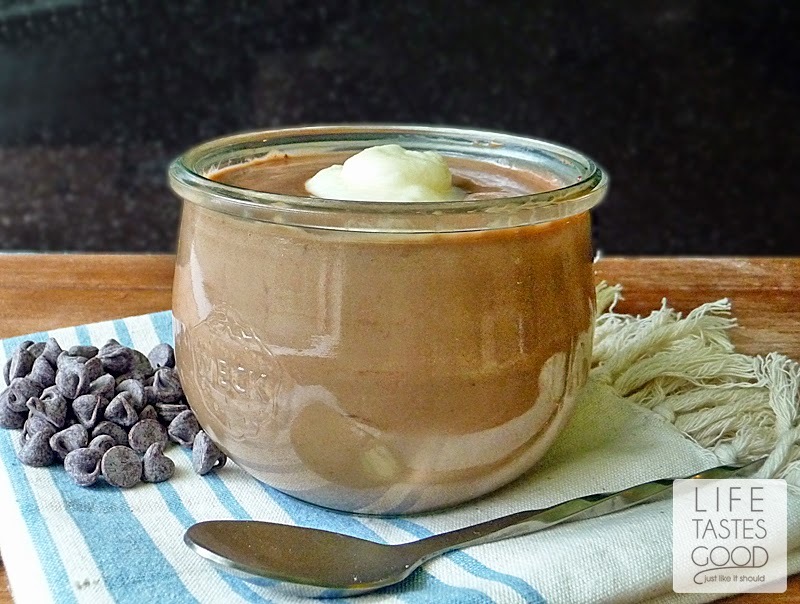 You just need about 20 minutes to make this 'healthier' homemade pudding! How great is that?! I also made some chocolate pudding by adding 1/2 cup of chocolate chips at the end when I added the butter. It is sooo good!! I like the tang as a result of using the Kefir. It tastes a little like chocolate yogurt and is great with bananas and some granola! yumm! I'm going to pick up some of the other flavors to make some strawberry banana pudding and blueberry too! Sign up to get coupons at lifeway.net and you'll save some $$$! Y'all know I like that!! Have you ever made homemade pudding? Which is your fave - chocolate or vanilla? In a medium sized sauce pan placed over medium heat, combine 1/3 cup sugar, 2 tablespoons cornstarch, and 1/4 teaspoon salt. 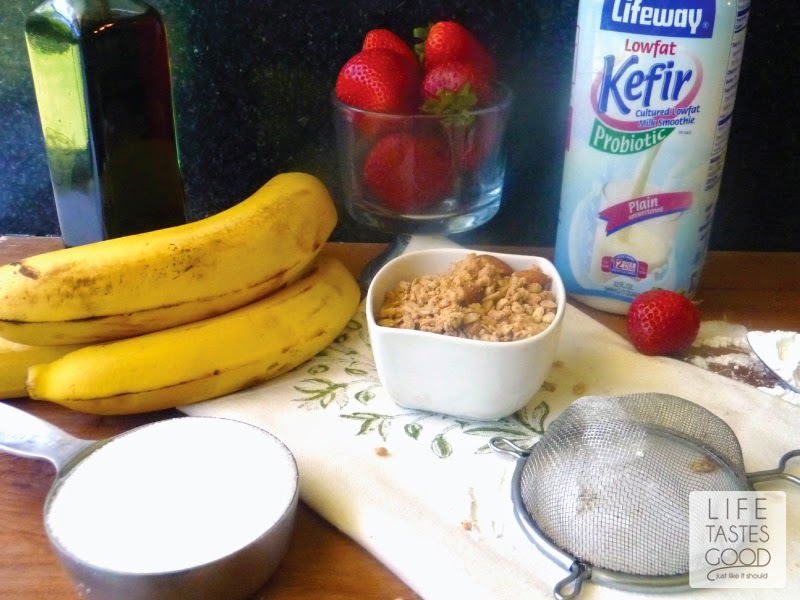 Mix well and slowly add 1/4 cup of the LifeWay Kefir Cultured Milk Smoothie. Whisk until smooth. Whisk in 3 egg yolks and the remaining Kefir Milk. Cook over medium heat, whisking often, for about 5-6 minutes until the pudding starts to bubble and thickens. Once the pudding has started to thicken, reduce the heat to mid-low and continue to cook another 5 minutes or until the pudding is very thick. Pick up some pudding in a spoon and drizzle over the surface. When ribbons will form on the surface it's ready to go! Remove the pudding from the heat and stir in 3 tablespoons unsalted butter, cubed, and 2 teaspoons vanilla until well mixed. Immediately pour the pudding mixture through a fine mesh sieve into a large measuring cup. Don't skip this step!! I know the pudding will look smooth and lump free, but there will be some cornstarch lumps in there! Trust me on this! No one wants to eat cornstarch lumps, so be sure to put it through a strainer. It doesn't have to be a large one. You can see in the photo of the ingredients that I use a small one. Sometimes I even pour through the strainer right into the serving dish if I think I can do it without making a mess! Once strained, pour into your serving dishes being sure to leave room for the fruit and granola, and place a piece of saran wrap right onto the surface of the pudding. This will keep it from forming a skin. Refrigerate about 4 hours or overnight. Once the pudding is nicely chilled and you are ready to serve top each with some granola and fresh fruit. I used strawberries and bananas as you can see in the photos, but any fruit will be delicious. Enjoy! These look so creamy and delicious and I love that they are healthy. I'm going to have to get me some of this. It is good to know that it has Vitamin D also. Our entire household loves Kefir. Thanks for this new idea for yet another use of this wonderfully nutritious product. I bought this exact Kefir not too long ago when I was feeling under the weather and was reading about all the good gut cultures this has and can help rid of bad stomach bugs. Sure enough, after taking probiotics I felt better in just a couple of days. I need to make it a habit to incorporate it in my diet regularly, especially after seeing your chocolate pudding! YUM! What a great snack. I would love to try this and SOON! I have never attempted to make my own pudding-I tend to buy it already made and sugar free! I have never tried Kefir but have seen the Yogurt smoothies in the store-I will pick one up and see how I like it. I attempted to make this once and it was a huge fail.. i just printed the recipe and will try again. That looks really yummy! I've never tried Kefir, but have heard lots about it. I love that you used it for this parfait. Yum! I have not used kefir before, I am going to give it a try! My fave is definitely chocolate, but they both look delicious and yummy. I love chocolate pudding. I am going to have to try this. Thanks! This sounds delicious! I haven't used kefir, I will have to try it! Everyone is singing the praises of kefire. I'm just going to have to break down and try it! It looks like I am going to have to try kefir, you make it sound delicious! My fave is Vanilla! Yup. I like chocolate, but I have always favored vanilla over chocolate. I know, I'm weird! I am going to pick some of this up next time I'm at the grocery! 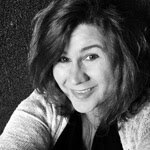 BTW, my former sil used to work for Winn Dixie, she loved it there! I tried the strawberry kind and it was awesome! Nice recipe idea! I'm a really big fan of kefir! Sadly haven't seen it here in Spain, but every time I visit Estonia, I drink it a lot. I haven't made pudding at home before, but I prefer chocolate one. I really like Kefir. My daughters are always asking me to buy it when we are at the store. This pudding looks really yummy. Unfortunately heating the kefir kills all of the good probiotics. You may want to tweak this recipe so that the kefir is added last after the mixture has had time to cool.